If you’ve been doing home theater a while, you probably have a lot of different cables lying around. You’ve probably wondered why there have to be so many choices. In some cases it’s a matter of size or convenience, but on other cases there is a real engineering reason why you have to see these connectors on certain cables. It’s usually possible to convert from one type of connector to another but because some cables are so closely associated with some kinds of cables it might not be wise. For example, the N connector is used with 50 ohm cable, while the F connector is used with 75 ohm cable. Using the wrong connector on the wrong kind of cable can cause a mismatch that can really have a negative effect on the signal that’s passing through it. For the most part audio connectors are chosen for size or for the ability to stay put. They’re interchangeable when it comes to quality. RCA connectors are used for audio and video and do well for digital and analog use. 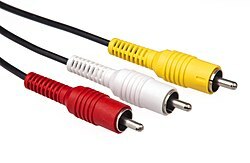 There was a time when the RCA connector was more or less the only connector you’d need. They’re used today for older home theater systems. The RCA connector stays connected with friction making it stronger than some connections but it’s still easily yanked out with a tug. The headphone connector is more correctly called a 3.5mm TRRS connector. It’s used for analog audio in places where space is tight, such as on phones. It pulls out easily and isn’t suitable for home use for that reason. In the past, this same connector was used to carry video and audio from camcorders, but it’s not suitable for digital data. The S-Video connector, more correctly called a 4-pin Mini DIN connector, has almost completely disappeared from use today. It was used to give the highest quality standard definition video connection, but it’s delicate and not suitable for digital data, so it doesn’t work for HD. DVI is another largely forgotten cable. It was used in the early 2000s for digital audio and video and was very easily adaptable to other uses, but it’s very very delicate, prone to breakage and it wasn’t popular at all for that reason. The HDMI cable is the most common cable used in homes today because it stays in fairly well but can be pulled out when needed, doesn’t have pins to break and carries HD video and audio. You’re familiar with the F connector because of its use for antennas and satellite. When properly installed, it’s weather-resistant and screws on tightly to keep a strong signal going from place to place. 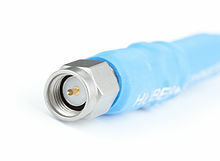 The F connector is the most common cable today for high-bandwidth digital data because when paired with the right cable, it’s very versatile. 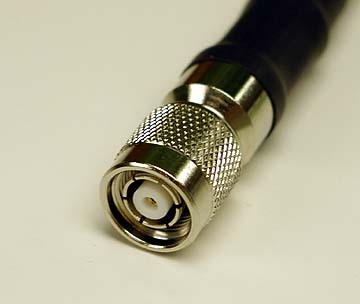 The BNC connector is still used for commercial applications. It’s easy to connect and disconnect and is very well shielded, but it’s not water-resistant so it is not good for outdoor use. It’s one of the few connectors that’s used for both 50-ohm and 75-ohm cable. The TNC connector is a variant of the BNC connector that screws on instead of using a push-and-turn motion. This makes it better for high-frequency applications like Wi-Fi because there’s less signal leakage. You’re likely to find this connector on router antennas. N connectors are used with 50 ohm cable and were the first connectors capable of handling really high-frequency, high-bandwidth applications. For many years they were commonly used for cell boosters and are still used for higher-end ones. The N-connector is almost always connected to 50-ohm cable. 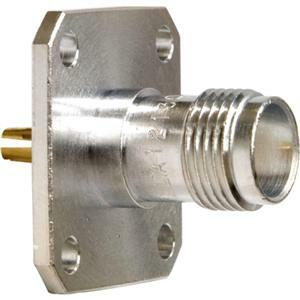 This SMA connector is starting to replace the N connector for 50-ohm connections within the home such as small cell-boosters. It looks like an F connector but is smaller. Like the SMA connector, the FME is used where you used to see an N connector, but it’s been designed to be as thin as possible for in-wall installations.